Hogswaller can be found wandering around the extreme northeastern part of the zone (where the oil rigs and MMM instance entrance are). Max hit ~3,500; enrages (does not rampage or flurry); partially slowable; fights to the death (does not run at low health). This page last modified 2008-09-03 10:23:58. This guys PHers is on a 20 min. spawn timer.camp left of the mmm instance zone in and his PHers will be the mob that roams right infront of u. i soloed him with 85 ranger and a healing merc. good luck getting him top spawn have been here 2 days and got him twice. Lol, what a fun mob this is. I'll tell you some fun things about the mob before I get to the basic facts. Hogswaller wanders in the NE corner of the zone, that area that says "INSTANCE ZoneIN (Raid)" on your map. He's a clockwork, but he's got a bucket in one of his hands, and every so often he'll stop and all the roboboars in the area will come wander over to him, and he feeds them. Very cute lol. "a hungry roboboar oinks with piggy delight." I believe the first emote indicated that hes spawned an add, and the 2nd one indicates that an add has despawned. my parses doesn't show being HIT by the adds, I believe that they just cast. My parses also don't show him as having CAST any spells, which leads me to believe that the adds are a mechanic, and not a spell, and that his static bolt is proc'd, and not cast. Our tank was a level 80 monk with 3400 AC, max defensives, 17% shielding, 91 avoidance, improved block III, improved dodge III, 8% dodge mod. his average hit was 1518.
his melee DPS was 606. (my parses didn't pick up the 7k nuke for some reason). His single target DD was landing for just under 7k, and landed several times. He didn't run on low health. He didn't rampage, flurry, or AE rampage. All in all, a pretty tame named for Fort Mech if you ask me. Just done this guy with our normal 4, Warrior, Shammy, Cleric and ranger, 2 mains and 2 boxed alts. Didnt notice the snare ae during fight, got hit twice with Static bolt, 9.3k, and he hits quick. Didnt notice any adds. And he still nukes for 8800. At least that's what it hit me for. Anyone done him in new version? Hogswaller and a few more mobs were tuned down lately. I was wondering if anyone has done him after the patch and can tell me what has changed. Does he still spawn the adds that dd for quite a bit, did they tone down the nukes from the oil slaps or what has changed? I need boots for a few characters, and had trouble with this guy before. 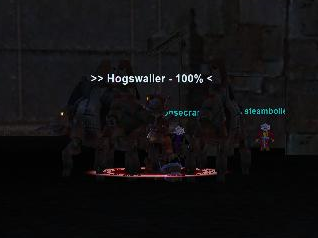 Hogswaller spawns in the North East area of the zone. After taking all the elevators to the top, head around to the north east and then take the long elevator down. In addition to the regular zone mobs, this area has roaming robotboars which can't be attacked. I know that Hogswaller spawns in this area as we found him up after a patch (roaming), however we have been unable to spawn him since then. If anyone knows what his PHs are please post them. Would anyone give an area of the fortress he is located in? There can be multiple oil slops up at once, as their despawn timer is not known to me, and he seems to bring them out every 6 - 20 seconds. The actual 8k dd itself has a very small aggro range but it is literally chain cast. The snare is a separate issue entirely. He spews out little blobs of ooze that snare people near them. As far as I have seen this should be done as a range fight with only the tank taking the AE. It will be cast non stop on him... good luck! AE is Oil Slop hit me for 8800. Not fully correct. AE is Static Bolt, but he does Oil Slap too.